Find a great meal in Fish Creek this winter at The English Inn, The White Gull Inn, or Juniper’s Gin Joint! Phone numbers, GPS directions, and menus can be found at DoorCountyChefs.com and on the Mobile Dining App. The English Inn is on the north end of town just past the Door Community Auditorium, offering supper with a cozy ambiance and their house specialty – Beef Wellington, featured nightly, as well as an All You Can Eat Fish Fry on Fridays for $19.95! On the south end of Fish Creek you’ll find The White Gull Inn, serving up an award-winning breakfast and lunch with specials daily, and a Fish Boil on Friday nights. If you love live music – make sure you get a room and a meal at White Gull during one of their remaining midweek White Gull Winter Concerts – next up is Mipso in March! 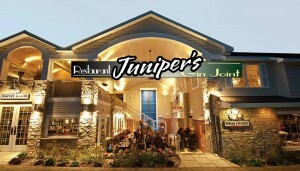 Juniper’s Gin Joint, also on the south end of town, is open for lunch and dinner on weekends (Fri.-Sun.) and while the building is grand, the restaurant welcomes casual diners with a deliciously diverse menu (including kids menu), wines and spirits from Door Peninsula Winery and Distillery, and an unbeatable dessert menu. Find what you’re hungry for faster with the Door County Chefs FREE Mobile Dining App for iPhone and Android, offering GPS directions, click-to-call phone numbers, and DC Chefs Member Menus, as well as upcoming dates on the new Door County Events Calendar! Need a room? 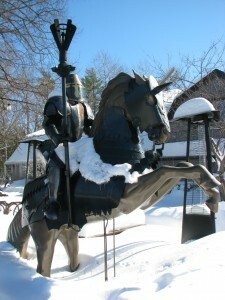 Check out WINTER LODGING SPECIALS in FISH CREEK on DoorCountyLodging.com!